It's that time of year again! Original Artwork from our Artists, Handmade Ceramics, One-of-a-Kind Ornaments, and More! Are you interested in joining our Membership Program? Here's the link: studiobythetracks.org/membership. Consider signing up (or giving a membership as a gift) because this year, SBTT Membership get early access to our Open House! If you've ever been before, you know how big of a perk it is to get in early. 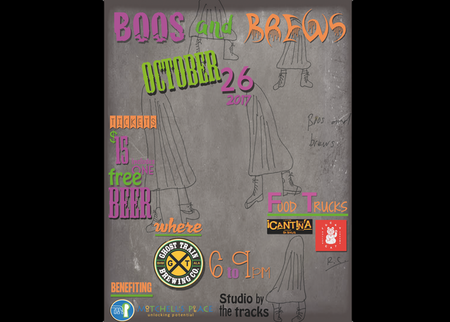 Join us at Back Forty Brewery on October 24th for Boos and Brews, hosted by the Junior Boards of Studio By The Tracks and Mitchell’s Place. Your ticket includes beer and a commemorative cup. There will also be a pet costume contest for a chance to win a pet portrait from SBTT Artist Dennis Brown. This is an event you won't want to miss. Grab your tickets today! Join us at Ghost Train Brewery for Boos and Brews hosted by the Junior Board of Studio By The Tracks and the Junior Board of Mitchell’s Place. Enjoy free beer! Cantina and Lucky Cat Rolled Creams will be featured. This is an event you won't want to miss. Grab your tickets online here: https://boosandbrews.instagift.com/. We're so excited about this year's Art from the Heart event! We've made some changes that we think should make this year's AFTH our best one yet. Your Super Mom needs her own coffee cup that reflects who she really is! These mugs feature Super Mom wearing her cape on one side and mowing the lawn on the other! How impressive! The mugs are $12.00 each and are dishwasher safe. Michael Hall, one of our very talented Studio artists, created the artwork. We want to see your Studio By The Tracks art! Enter our photo contest for a chance to win two passes to Art From The Heart this year. Send your photos to photos@studiobythetracks.org from April 3rd-28th. Click here for more details. We're running an online exclusive sale during the month of March. We're excited to announce that we will be having an art opening featuring over 30 pieces by SBTT artists at the Grand Bohemian Hotel Gallery. It's that time of year again! We will have one-of-a-kind Valentine's Day cards featuring original illustrations by some of our artists. Each one is a minimum $10 donation and makes a great, fun gift all by itself. Stop by the Studio's reception shop anytime between 10-3pm, Monday through Thursday. They can be for your sweetie, your momma, or a friend! So come show some love. Ps. The back of each card tells the recipient of the card that a donation has been made in their honor, and includes a brief description of the Studio. Join us on Thursday, January 26th for the opening reception of our first show of the year entitled 'Go Figure'! This multi-artist show with feature a variety of figurative work from several local artists including Amy Piette Collins, Leo Wright, Karen Libecap and several Studio by the Tracks artists. The reception will be held in the Gallery from 5-7 PM and refreshments will be served. Look forward to seeing you there! We will be participating in the 2016 Flameworks. Come out Friday, Saturday, and Sunday! Join us for drinks and apps from 5pm-7pm at the GrandBohemian Hotel Gallery. The Studio will have some of our artists represented among the rest of the gallery's great collection. It's a great, free event - so come have some fun! A portion of all art sales during the event go to support the Studio. We will have our annual open house at Studio by the Tracks Thursday, Nov 17th at 5:30 (note that's a half hour later than last year's starting time). As usual, we'll have fantastic SBTT artist works of all shapes and sizes. Unique ornaments, beautiful ceramic pieces, hand-crafted wreaths and much, much more. We are excited to be able to show off our building's new re-model, too. It should make this year's open house the best one yet. Come early for the best selection, and cross off a lot of items on your gift lists! Doors open at 5:30 firm. We will be accepting cash, check, and credit. While we will have paper bags to take your goods home in, we encourage everyone to bring their reusable bags as well. We're so thrilled to announce that starting on November 18th, 40 pieces of art from our artists will be featured on One King's Lane until mid-December. One King's Lane is a renowned online retailer known for their taste-making style. They feature limited runs of handmade furniture, art pieces, ceramics and more from international artists. So imagine our delight when the Studio's artists were chosen to be featured. Our art, along with a photo essay about the studio, will be specifically featured the week of November 13th. And our work will be available for purchase through OKL for a month.